Why is "Profile" present as a class? 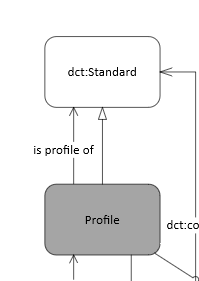 This model also implies not using dct:Standard ("A basis for comparison; a reference point against which other things can be evaluated.") at all. 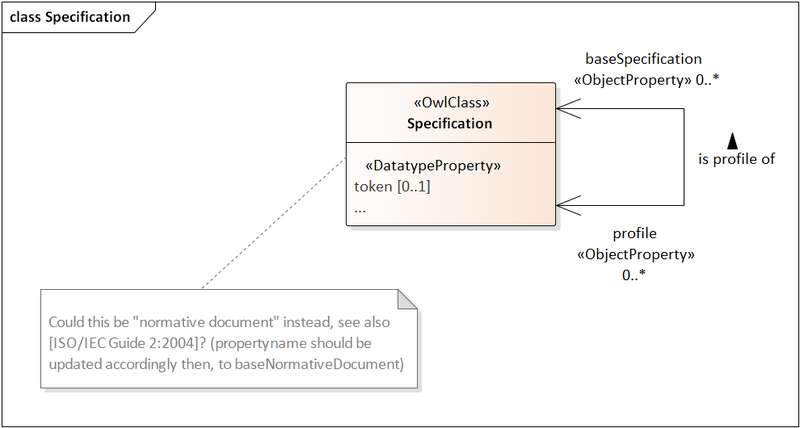 The information that is currently modelled with ResourceDescriptor and its relations, couldn't that be generalized to specifications in general, and be useful? Note: I used "specification" as that term is used in several places in the set of documents of profiles. Other place mention "standard". Previous message: Alejandra Gonzalez-Beltran via GitHub: "Re: [dxwg] Use case: modeling permissions, obligations, prohibitions (#224)"
Next in thread: Stephen Richard via GitHub: "Re: [dxwg] Conceptual model: Profile: class vs. property (#716)"
Reply: Stephen Richard via GitHub: "Re: [dxwg] Conceptual model: Profile: class vs. property (#716)"
Reply: Rob Atkinson via GitHub: "Re: [dxwg] Conceptual model: Profile: class vs. property (#716)"